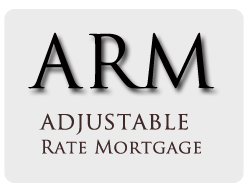 Does an Adjustable-Rate Mortgage Make Sense? In recent years, adjustable-rate mortgages have been thought of by many as irresponsible borrowing. However, they’ve been making a comeback, especially among more affluent borrowers. An ARM may be the right choice for some, even if common sense leads you to believe otherwise. It is always advisable to work with an experienced lender to help to secure the best loan for each individual borrower. An adjustable-rate mortgage offers an introductory period in which you pay a lower interest rate than with a fixed loan; after that, the rate can swing up or down. With rates near historic lows, the safety of locking in a fixed rate attracts many borrowers, and paying a premium is well worth it for the security. The spread between rates on 30-year fixed-rate mortgages and the most popular ARMs now stands at about one percentage point, more than double the difference just five years ago. That means that homeowners who are planning to either move or pay off their mortgage over the next few years can save big with an ARM. Take, for example, a homebuyer who plans to pay down an $800,000 mortgage. The rates on the fixed portion of a 5/1 ARM — which is guaranteed for the first five years and adjustable once a year thereafter — are nearly always lower than what a hypothetical borrower could opt for with a 30-year mortgage. If after five years, however, the rate on the ARM increased at a moderate pace of one percentage point a year, the initial savings wouldn’t be eclipsed by the fixed rate until the 10th year of the loan. This makes the 5/1 ARM look very appealing! The ARM may not the right choice for every borrower, but it should be considered on an individual basis. The key to success is working with a loan officer who has the knowledge and expertise to guide you through the process.